I met Keith about a year ago. He is two years younger than I and lives on Columbus Avenue about a block away from Columbus Circle in Manhattan. He was born in New York City and grew up in Harlem with his parents and his older sister. Life was difficult for his parents, but they managed "by the grace of God". He is quite proud of his older sister whom he characterizes as a tough black woman. Through hard work and much effort she was able to pay off the mortgage on a beautiful brownstone in Brooklyn. Keith attended high school in Harlem and successfully completed requirements for graduation. Immediately after high school, he joined the Army (in which he spent three years) and was posted to Germany. He recalled that this was around the time of the tearing down of the Berlin Wall. Keith suffers from epilepsy. He said he managed to get past the Army screening system because his epilepsy was not the severe kind. He has also been suffering from hernia for the past several months and has been put on the waiting list for treatment. The wait and the pain has been interminable, but Keith fights on. Unfortunately, Keith lives on the street. 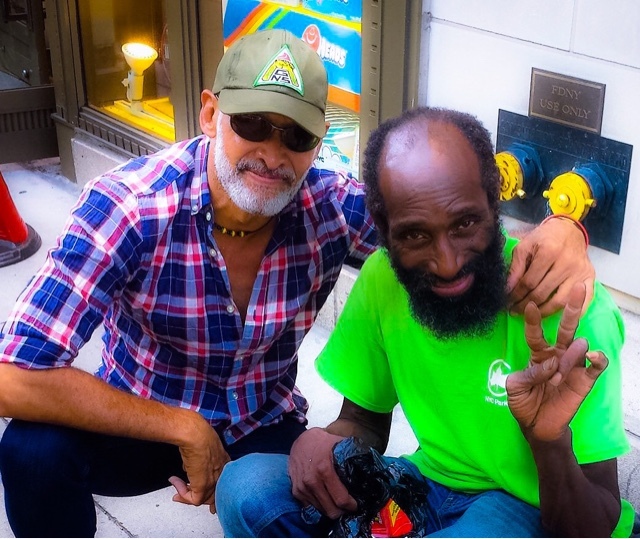 He has been living on the street since he left the service in the late eighties. When I asked him how he was able to survive the streets he said that it was only by the grace of God. Keith does not looks the part of the unkempt, unwashed homeless as he tries his best to stay clean. He laments the country's treatment of its veterans, saying that they are preferred dead rather than alive. Nonetheless, he continues to survive "with help from God". His tenacity, his resilience, and his faith in God has impressed me ever since I got to know him. Whenever I need to find my balance in this teetering world I seek him out. God bless you, Keith.